Invisalign is a wonderful option for people who want to improve their smiles and also avoid metal braces. This is a method that uses clear aligners to gradually move the teeth into the proper position. With Propel Orthodontics, the treatment is more efficient than ever before. The VPro5 and the Excellerator Series speed up the orthodontic process to help you enjoy your beautiful smile in even less time. Keep reading to learn more about this wonderful treatment option. The Invisalign system is made up of a series of removable plastic aligners that are customized to fit your dentition at each stage of the treatment. You will be instructed to wear each set for 1 to 2 weeks, depending on our recommendation, before advancing to the next in the series. For added convenience, you can take Invisalign out before you eat, drink, and brush and floss your teeth. The average treatment time with Invisalign is between 6 months to 1 year -- but with the VPro5 or Excellerator Series from Propel Orthodontics, treatment times can be greatly reduced. It is extremely important that the Invisalign aligners fit properly and securely around the teeth. An improper or loose fit can delay treatment times or possibly require patients to backtrack in their treatment and wear a set of aligners a second time. The VPro5 offers a solution to help ensure secure seating of the aligner to prevent this common issue. The daily VPro5 treatment is completed by the patient in just 5 minutes. After inserting your Invisalign aligner, simply bite down firmly -- without clenching the jaw -- on the VPro5 device for 5 minutes. The mouthpiece is comfortable and easy to clean up after use. The vibration gradually increases, so there are no surprises. Once the 5-minute treatment is complete, the aligners are properly seated to help ensure the aligners do their job with the maximum efficiency. It’s simple, easy, fast -- and it works! Everybody’s talking about the Excellerator Series -- and it’s no wonder why. These small, handheld tools operated by your dentist create small “manual osteoperforations” (i.e. dental dimples) which can dramatically accelerate orthodontic treatment -- sometimes by 50% to 60%. The dimple is a minor injury that temporarily weakens the jawbone, allowing the teeth to move faster. It just takes a few minutes to perform this treatment during your regularly-scheduled appointment. We will slightly numb your jaw to ensure you do not feel anything at all throughout the process. 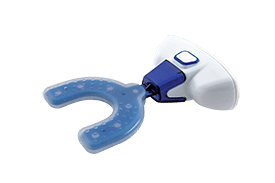 Propel Orthodontics makes three tools in the Excellerator Series, which gives your dentist greater flexibility depending on your needs. If you are interested in learning more about the VPro5 or Excellerator Series for Invisalign, we invite you to contact the office of Generations Dental today. Request an appointment online to get started discussing accelerated orthodontics!